Increasing incidence of pocket lighters exploding, causing severe injuries as well as fatalities to consumers across the world, has created a negative space for their adoption. Top brands in pocket lighters such as Société BIC S.A. are facing the flak of consumers for their inability in provide safer products. In the coming years, BIC and other prominent pocket lighter manufacturers such as Clipper, Tokai Corporation, Ningbo Xinhai, Swedishmatch, Baide International, Zhuoye Lighter, Benxi Fenghe Lighter, Focus, Wansf, Cixi Xinyuan Cigarette Lighter, Hefeng Industry, and Deko Industrial will be focusing on improving the consumer safety of these products. 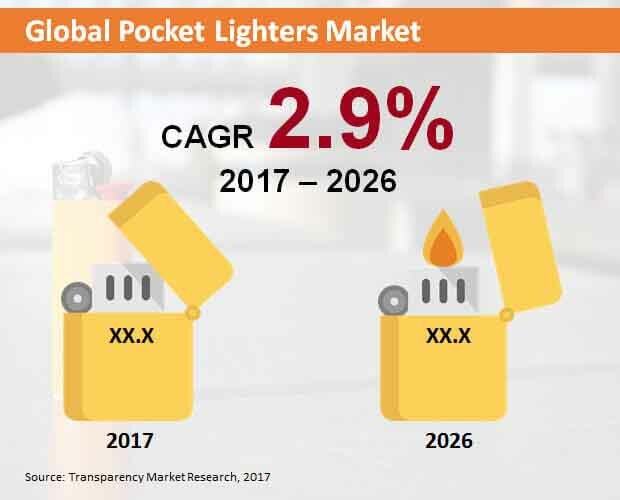 Transparency Market Research observes that several companies will be focusing on offering flameless pocket lighters to recapture the fading interests of consumers worldwide. Transparency Market Research’s latest report foresees the global pocket lighters market to expand sluggishly at a CAGR of 2.9%, reaching a US$ 7.4 billion valuation by the end of forecast period, 2017-2026. Increasing incidences of exploding pocket lighters has been observed as a major threat to the growth of global pocket lighters market. Conventional pocket lighters, known as flint cigarette lighters, will represent top-selling products in the global market throughout the forecast period. More than 70% of pocket lighter consumers in the world will be buying flint cigarette lighters in the coming years. Few years down the line, however, the demand for flint cigarette lighter will fall, pertaining to their risks in storing pressurized inflammable gas. Electronic cigarette lighters will take up this falling market traction of flint cigarette lighters and reflecting highest value CAGR of 3.4% over the forecast period. With safety being the most critical factor influencing the sales of pocket lighters, metal materials are expected to be widely used in their production in the future. By the end of 2026, nearly US$ 2.28 billion worth of metal pocket lighters will be sold worldwide. Several companies are likely to cease production of plastic pocket lighters. However, high profit margins associated with production of plastic pocket lighters will poise their global market value share at nearly 70% through 2026. It has been revealed that mom and pop stores will be the largest sales channel for pocket lighters in the world. Along with convenience stores, more than 50% of pocket lighters will be sold through these sales outlets. Online retailers will mark their presence in global pocket lighter sales by reflecting highest value CAGR of 5.7% over the forecast period. In 2018 and beyond, more than 60% of pocket lighters will be sold and manufactured in the Asia-Pacific excluding Japan (APEJ) region. Majority of companies manufacturing pocket lighters are expanding their production bases in China, India and South Korea. Low wage characteristics of several APEJ countries will fuel the attractiveness of the region across the global pocket lighters market in the coming years.